As the oldest neigborhood in Manhattan NYC the Financial District is home to a plethora of Wall Street Brokers / Traders, Hedge Funds, Accounting Firms, Legal Firms, and Insurance Companies. In fact in the early 20th century the northeastern section of the neighborhood was known as the Insurance District due to the abundance of Insurers onced housed there. 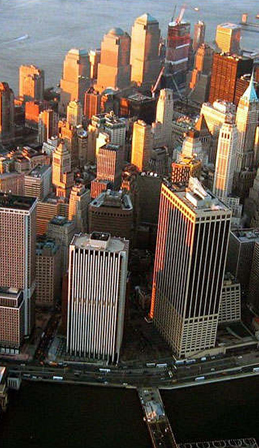 Search & Find Financial District Office Space or Wall Street commercial real estate for lease / rent or for sale. We can provide your buinsess with a comprehensive real estate report detailing each applicable property that meets or exceeds your expectations. 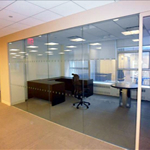 There are hundreds of office vacancies in lower Manhattan for lease, allowing for a unparalleled period of space availabilities throughout the neighborhood, we can set up a tour anytime. 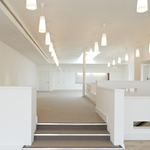 This report will detail the spaces / properties which match your business requirements. 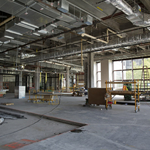 Our internal website database contains over 400 Million SF. of available commercial real estate which is updated daily! The office listings herein were selected for their superior standard of value & quality. Downtown Office Sublet for Lease 1,500 SF. / $32 SF. Near the Cobblestoned Streets by Stone and Hanover – These newly renovated offices stand inside a 1,500 square-foot pre-built sublet that’s perfect for the personal-professional startup, strike-out professional and or someone simply looking to work “at home” without actually working from home. 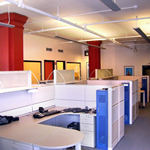 Though the property does not have all the corporate amenities of nearly Wall Street, this space sublet can fit the needs of a small business with adjustable cubicle sizes/configurations, in addition to a director’s station (bullpen). Furthermore it comes with a small conference room, as well as state-of-the-art phone and video conferencing. Downstairs, old New York is readily seen through all the shops and attractions of the South Street Seaport, one of New York’s favorite attractions. Broad Street Office Sublet for Lease 3,100 SF. / $34 SF. 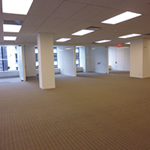 Made-to-Order Sublet in Lower Manhattan – This 15th-floor, 3,100 square-foot sublet in a Class-A building off Fulton fits the growing needs of any new accounting firm, tech firm or financial services outlet. With high-end finishes, new carpet and a South-facing wall of windows, employees have the option of looking at gorgeous sky or down on the Wall Street foot traffic. 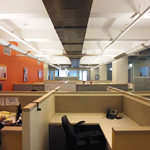 The management company will work with client requirements in terms of layout, whether open, cubicle or bullpen. A conference room with sliding glass doors and CISCO-enabled teleconferencing, a wet pantry and two restrooms ensure the necessary amenities for early-morning or late-night meetings from across the world. Broadway Office for Lease 4,000 SF. / $33 SF. Office steps from City Hall perfect for Law Office or Financial Firm – Situated just above the Battery, this space features 6 private offices + a bullpen, open cubicle arena and conference room all totaling 4,000 square-feet of production space. Large windows with good exposure to the South and East offer a view of the Brooklyn Bridge and the East River. The office features an ample kitchen with space for caterers to prepare office receptions and lunch conferences. A stone’s throw from the heart of New York City government, this must-see space comes with a negotiable price, close proximity to most of Manhattan’s subway lines and several of downtown’s most exclusive hotels for out-of-town clients. Broad Street Office for Lease 5,500 SF. / $32 SF. Commercial Sublet in Downtown Manhattan – This landlord is looking for a financial company to take over its 5,500 square-foot bullpen office in a Class-A property steps from the downtown heliport, the famous Delmonico’s and the Fraunces Tavern, where George Washington drank. 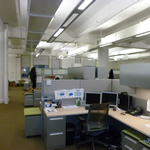 Surrounded by flat-screen TVs, advanced CISCO video conferencing cubicles and high-speed Internet – all with 24/7 IT service – this large space is priced to move in a pacing-up economy.No-hassle terms make for a smooth transition to Manhattan from another country or downtown to a change of scenery that includes Battery Park. Nearby, a number of boutique hotels and corporate apartments grant tired international guests a grand New York welcome! Mid-Building 7,000 SF Raw Space Waiting for a Creative Touch – Though located in a Class-A building recently purchased and renovated, this 7,000-square foot commercial space offers plenty of room for inspiration and ingenuity. Having taken part in downtown's largest capital improvement program, the downstairs advances include a new lobby, new entrance and a 24 hour/seven-day per week remote monitoring system. 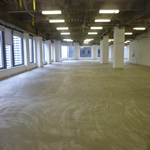 User friendly management - the landlord will configure this floor to any specification, though ideally suited for New York bureaus of financial news agencies, global think-tanks or headquarters of a small(ish) international nongovernmental organization. Regardless of need, new tenants can count Thermopane operable windows, advanced CISCO telecom systems and a redone kitchen with stainless-steel finish. Leases signed in this building may qualify for the city’s Commercial Revitalization Tax Incentive Program. Water Street High-Rise with Spectacular Views of the Harbor – A draw to some of the world’s most prestigious corporations and law and accounting firms, this 9,000-square-foot office in a Class-A building is ready for instant occupation. 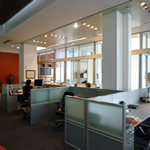 A large renovated reception area provides a gateway to newly redone offices and cubicles featuring beautiful hardwood floors, freshly painted walls and an embankment of large windows with a spectacular view of New York Harbor, including the Statue of Liberty. Brooklyn employees are a quick walk or bike ride across the Brooklyn Bridge while Upper Manhattan straphangers are close to all lines at the newly refurbished Fulton Street station. Lawyers for high-profile cases can be at all courthouses and judges chambers within minutes; all financial industry types can look down on Wall Street. As the seasons change, so do the landscapes of nearby City Hall Park and the Battery – perfect for a pushcart lunch or an afternoon coffee break. State Street Office for Lease 7,500 SF. / $45 SF. Lower-Floor 21st Office Outfit in Eco-Friendly Building – Premiere property is looking for an upstart law firm, think talk or advocacy organization to take over this 7,500 square-foot, 3rd-floor modern office with advanced Verizon Fios video conferencing cubicles, bullpen-suites, high-speed WiFi and a refinished lobby with hardwood floors and built-in seating. The selling point of the building is its eco-friendliness, however. In following the trend of other renovated Manhattan buildings, the new owner has installed partitions made of recycled material, energy efficient electrical and a plumbing system that recycles waste-water. A full-time doorman and high-tech alarm system keeps all amenities safe and functional. Upper-Level, 10,000 SF Space in Landmarked Turn-of-the-Century Building – Perfect for an established real estate brokerage, accounting business or law firm, this is a 10,000-square foot, 17th-floor office at 48 Wall Street, formerly the Bank of New York Building, which has recently completed a $60 million renovation. Transforming the property into a modern first class office building, the upgrades offer the latest in technology and luxury services, including new fiber optic backbone for broadband Internet access, tenant controlled 24-Hr HVAC with floor-by-floor DX units and state-of-the-art Otis Elevonic elevator system. The building, a National Register landmark office building, features an exterior in limestone and is crowned with a copper eagle that was one of the most visible elements of the New York skyline during the roaring 1920s. 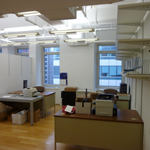 Whitehall Street Office for Lease 12,000 SF. / $32 SF. Class-A Executive Feel in Renovated Skyscraper – Priced to move, this 12,000-square-foot rental space situated in building directly off Maiden Lane and down from the South Street Seaport offers a large, breathtaking lobby, 24-hour security and round-the-clock maintenance. With ample room for several dozen mid-sized offices and cubicles to match, the space also has offers two dedicated conference rooms wired for global networking, its own pair of private restrooms and a full kitchen. Steps from numerous hotels, the PATH and subway lines allows for the seamless accommodation of commuters and uptown straphangers. Nearby, the finer downtown bars and restaurants make entertaining clients hassle-free. Riverfront Ground Level Office and Distribution Center Won’t Last Long – Situated next to an East River pier, this 15,000-square-foot space features a 2nd-floor-office above a large warehouse with potential for a large import showroom or other shipping endeavor. Perfect for one of the dozens of large companies bringing some of the finest goods to NYC – adjacent storage can fit an array of rugs, furniture and art – other possibilities abound, including a commercial photography studio or a large-scale film studio. Upstairs bullpen offices include flat-screen TVs, advanced video conferencing and high-speed Internet. For the right lessee, management will renovate per the closest of specifications, including thereconfiguration of columns, mushroom capitals and drop plates to accommodate all activities in the space. Neigborhood Details Noteworthy Properties: 200 Liberty Street. Organizations with Headquarters in the Area: AIG, The American Civil Liberties Union, The Bank of Japan, The Bank of New York Mellon Corporation, Clearstream, Country-Wide Insurance Company, Duane Reade INC., First Manhattan Abstract Corp, The Guardian Life Insurance Company of America, HIP Health Plan of New York, Horizon Engineering Associates LLP, IBEX Construction, International Securities Exchange Holdings, JMH Education, The Juvenile Diabetes Research Foundation, Liberty International Underwriters, Marketing Technology Group, Michael Goldman Architect P.C., Mortgage Industry Advisory Corporation, Museum of American Finance, New York Daily News, Oppenheimer Holdings Inc., PM Contracting, R.I.B. North America, Regal Title Agency, Shutterstock Imagines LLC, Transatlantic Holdings, Inc., The United Federation of Teachers, and the World Trade Center Dental Group PC as well. Nearby Landmarks: Canyon of Heroes, Castle Clinton National Monument, Fulton Fish Market, Museum of American Finance, New York City Police Museum, Skyscraper Museum, South Street Seaport Historic District, The Museum of Jewish Heritage, National Museum of the American Indian, The New York Stock Exchange (NYSE), Staten Island Ferry Terminal, Statue of Liberty and Ellis Island Ferry Terminal, Trinity Church , World Financial Center. New York Marriott Downtown, The Ritz-Carlton New York, Battery Park, The W Hotel New York - Downtown.